Our Murano Glass Tubo Hanging Lamps are equally at home in either traditional or contemporary settings. 24 karat gold fused with the lapis colored glass will add an additional bit of sparkle whether on or off. 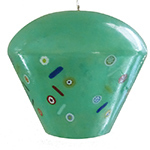 The Murano glass globe/shade is approximately 4 inches in diameter and 9 inches long and comes attached with a 4 foot cord for adjustablility. The electrical light socket is the standard U. S. E-12 candelabra base socket.